Great run yesterday with Neill (@BigBigGeek, bigbiggeek.wordpress.com). We got to run the same route as last Saturday, but I was a bit early, so I ran 3 miles ahead of his arrival. So all in all I made 13 miles on Saturday and had great conversation and company. Today is my long run, but I am not going for 20 miles since I am 2 weeks away from my marathon and I did 13 yesterday. I am going to try for 15. I am sore, but I had a great night sleep so that will help. For some reason I’ve noticed that I am usually in a bad mood during the day after my long run. I don’t know why other than maybe I’m tired? Here is my Hangin’ with the Dog pic for this week. I cheated and took it yesterday (but I am hangin’ with her this morning). 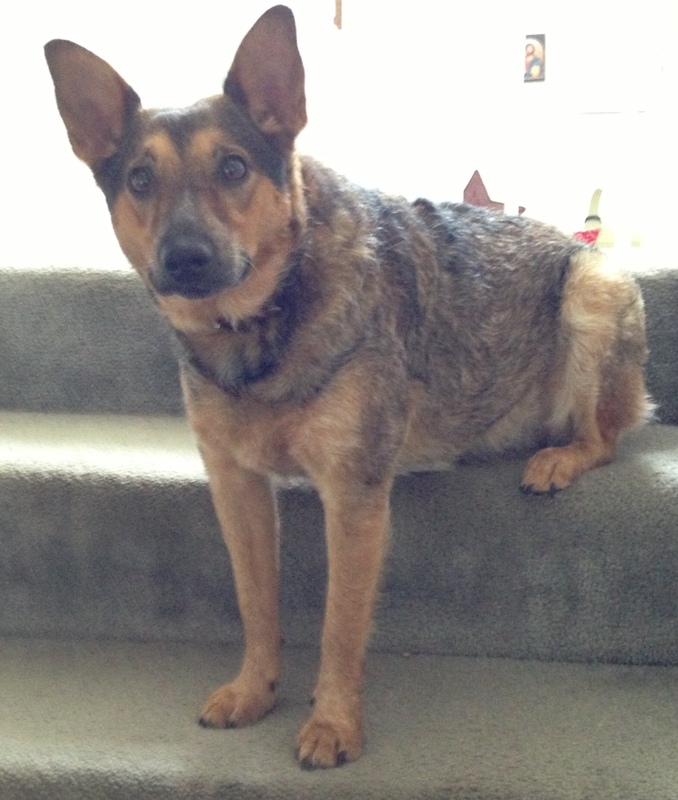 I think it is funny how she likes to “sit” on the stairs. Have a great Sunday and thank you everyone who gave insight into tapering yesterday. It was great help. I will post my ending thoughts and tapering plan sometime this week. This entry was posted in dog, Marathon training, Running and tagged @BigBigGeek, Marathon Training, running. Bookmark the permalink. ← How much do I taper for my marathon in 2 weeks? Such a cute picture. I look forward to your “Hangin’ with the dog” photos. She is pretty! That sitting on the stairs thing made me smile too. I knew a great dane that did that same thing, but to sit on your lap, I think he had aspirations to be a lap dog. It was really funny. Ha. A Great Dane as a lap dog!!! My daughter would love that! Very funny. I really enjoy your posts. I’m a new runner, and I always learn from you. Your testimony is inspiring. I’m praying for a great marathon for you. Thank you! Prayers are always appreciated!!! Thanks for your encouragement. Nothing better that a good couple of runs. Oh yeah. I totally agree!